This past weekend, we decided to go to a Hershey Bears hockey game (and you can read more about that at The Classical sometime next week). During the preceding days, I was on campus, working to get everything necessary for the semester settled. The process for preparing to teach four classes and direct four creative writing portfolio projects entailed three course redesigns and one curriculum revision, which was a lot, but all of it will be helpful in the long-term. The week ended, and Saturday came, and with Saturday, a meeting of the knitting group. 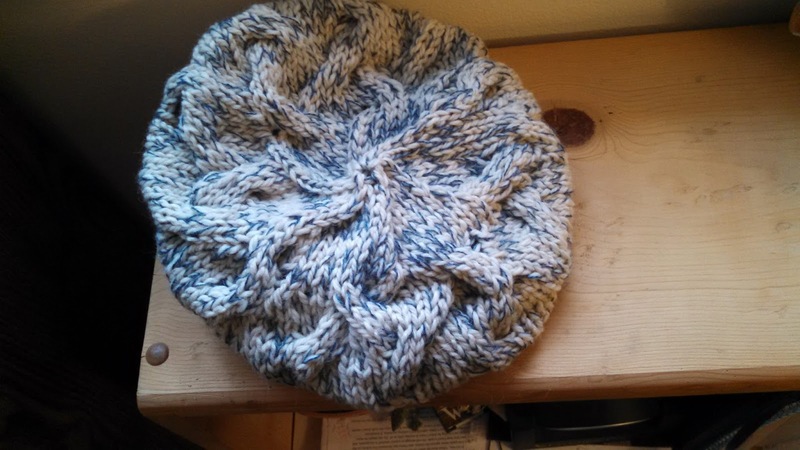 Just before walking out the door with a just-started sweater project in my bag, I decided I was going to knit a hat. I was going to knit a hat I had my eye on for more than a year, and I was going to knit it in time to wear to the hockey game. I scrounged around for yarn that would suit the pattern, coming up with a partial skein of bulky, cream-colored wool and a ball of leftover blue laceweight. The blue, I was certain, was more than enough. For the other—the part that would actually become the hat—I could only guess. In my hand, it seemed like it would work. I knit like a fiend at the meeting, and I knit through one and a half televised hockey games. 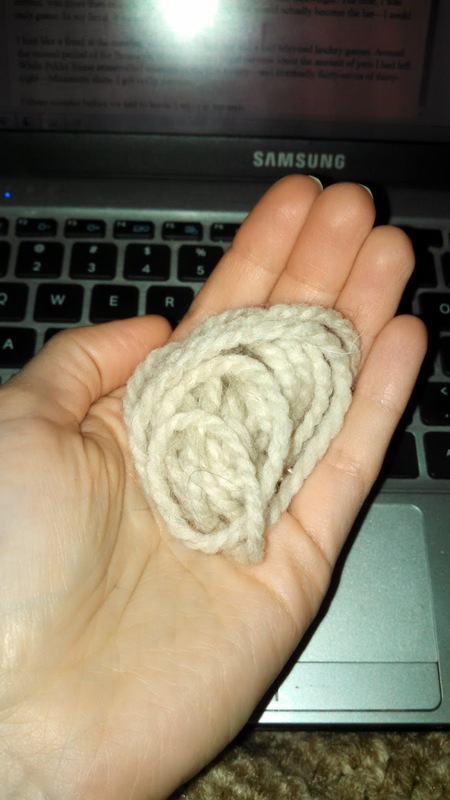 Around the second period of the Bruins vs. Flyers, I started to get nervous about the amount of yarn I had left. While Pekka Rinne stonewalled nineteen of the first twenty—and eventually thirty-seven of thirty-eight—Minnesota shots, I got really nervous. Fifteen minutes before we had to leave, I wove in my ends with this much yarn to spare. Doesn’t have to be a lot. Just has to be enough. The hat itself has proven to be exactly what I wanted it to be, so much so that I am considering making one in another color. I don’t usually make things that can be done in a day. I gravitate toward fussy things on small needles (socks, lace) or large things on whatever size (blankets, sweaters). For all that they’re the first things most people think of, I’ve knit perilous few scarves and hats, and Saturday’s project felt strangely like magic. In the morning, I wanted a hat. In the evening, I had one, and it was one I’d wanted for ages. I need to keep remembering how uncomplicated that process can be. All I needed to do was decide. All I needed to do was start.